Simple, delicious, and oh so good for you. Blend it all up, of course in your Vitamix. This shake is full of chocolaty goodness. And with these super-food ingredients it’s loaded with calcium, protein (15g from the powder alone), omega 3s, potassium, and all the goodness of cacao. 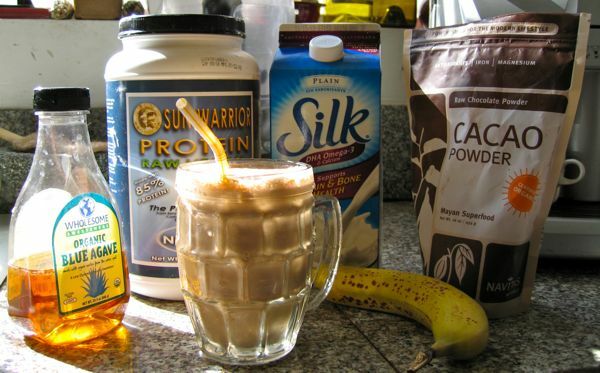 Only addition that could possibly make it better is peanut butter, like a Miko’s Miracle from Secret Spot. Maybe next time. 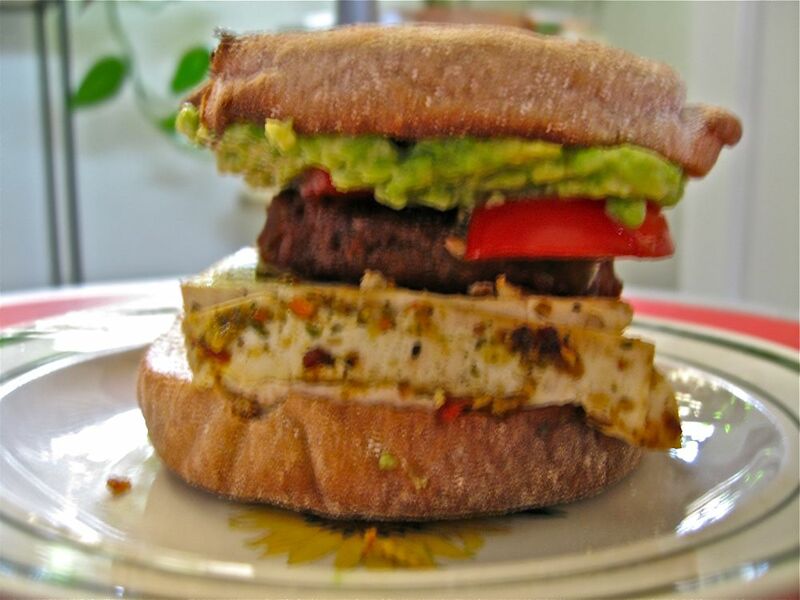 ….of delicious chickpeas and spices, FALAFEL! Who doesn’t like delicious falafel, complete with tomatoes, onion, tahini, hummus, lettuce, or any of many, many more vegan toppings (10+) at Maoz falafel stand. Other than the fried in oil bit, falafel is quite good for you, with lots of protein, b-vitamins, & minerals. The first store opened in Amsterdam in the early 90s, but now they have 25 stores all over the world; France, Spain, Germany, America, and India. 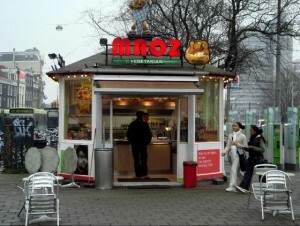 My lady friend Janie and I ate there in Amsterdam, right across from Centraal Station, and it was divine. Plenty of spice if you like, and everything is vegetarian, and I believe most toppings were vegan. And to top off a great meal, it was cheap. Tasty, nutritious, & cheap, the trifecta of dining, for me anyway. Of course in Amsterdam there are lots of reasons to be …uh…hungry, but their other worldwide locations have been quite successful as well, and founders Nachman and Sima Milo plan to be the veg McDonalds, with a goal of opening 1000 locations! We really hope they do, although I have a feeling either Native Foods or The Veggie Grill might get there first, at least in the USA. 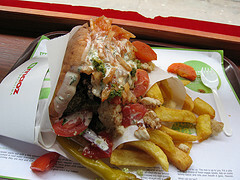 You can download Maoz extremely simple menu here. Vegan MoFo Day #2 or What I Ate in Ireland. i lived in the beautiful country of ireland for most of 2002. i was working in dublin at an internet cafe where many younger people worked. i made friends. more importantly, i made friends with people who liked food as much as i do. i have to admit i was totally shocked at the amount of veg goodness i found in that city. i was in love. 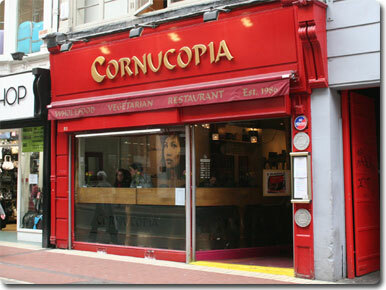 the first cafe i remember going to was Cornucopia. i remember walking there with catey and seeing a sign on their window that read “give peas a chance”. (you can’t resist a good play on words) i smiled. i looked at catey. she smiled. we wanted to go to there! they are not 100% vegan but always had vegan options. the hip bohemian crowd that works there are in constant hustle mode. everyday there are new dishes. the place was busy all the time and had a happy vibe. i fell in love with running out of the rain into this place and being instantly comforted by the warmth and totally delicious smelling food. they often had lentils and curries. Cornucopia is set up cafeteria style so you go in , pick up a tray and saunter down the line pointing at yummy and interesting things while some sweet hipster ladles it onto your plate. further down you can pick breads, soups, drinks and then pay. i think this place has expanded since i have been there last. check out their website where you can check out the menu. 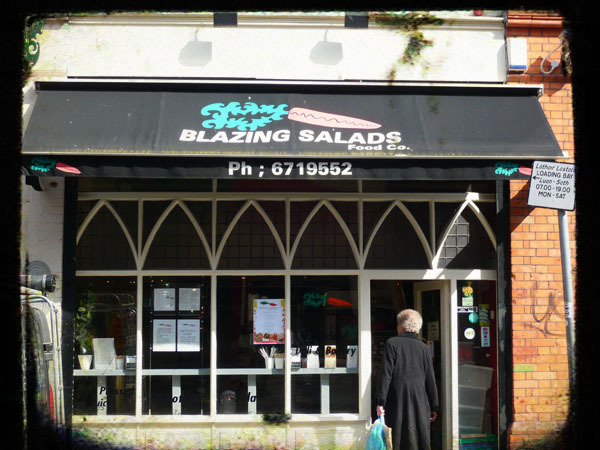 i was planning on also telling you about a few more dublin places in this post but i will have to do part 2 tomorrow. it will be a gas! (that is foreshadowing!) Happy MoFo-ing!